The third Stevenbomb has begun, bringing us lies, damned lies, and Sardonyx. Spoilers to follow. Our episode begins with Amethyst and Steven watching Crying Breakfast Friends!, only to have the message interrupted by a message from Peridot. This distress signal (a cry for help, if you will) is apparently being broadcast through every possible wavelength, showing up on Connie’s TV too (as Steven learns from calling her). Garnet identifies this signal as only having one possible point of origin, the communications hub last seen in “Coach Steven,” which I’ve only now realized I think I somehow missed when it was originally on, and is maybe the only episode of the show I haven’t actually seen. Huh. Good thing the show is on Hulu, I suppose. They reach the hub via Lion, and discover that it has indeed been partially rebuilt, and is broadcasting Peridot’s signal. The easiest way to destroy the hub again is to turn into a giant woman, of course, but Garnet refuses to fuse with Amethyst after what happened to the communications hub last time Sugilite fused, saying that she’s too brash, and that Amethyst is too reckless. That means it’s time for Pearl to get a chance to shine, as she (very excitedly) gets told to get ready to fuse into a gem we’re meeting for the first time, Sardonyx. Sardonyx destroys the tower with both precision and ease, though Amethyst, ever the jealous type, doesn’t seem thrilled about it, especially since Garnet apparently still doesn’t trust her enough to fuse after what happened last time. The next day, Garnet and Steven are watching an episode of Crying Breakfast Friends!, when the signal is interrupted by Peridot once again (I love the foreshadowing here, by the way. Apparently Spoon was misled by Pear, and Pear is pleading forgiveness. When Steven asks Garnet if she would forgive Pear, she shrugs). They return to the communications hub, and find that it’s been rebuilt the same as the first time. Garnet and Pearl fuse once again in order to destroy it, and Amethyst gets some time to sing. As far as Steven Universe songs go, I found this one, “Tower of Mistakes,” to be pretty middle of the road. Of course, it still wasn’t bad, and it really helps you feel for Amethyst as she sings about her own regrets, and how she blames herself for what happened, wondering if she’ll ever be able to earn Garnet’s trust back (and noting that she misses how powerful being Sugilite feels). Steven notices this, and forms a plan. That night, Steven takes Amethyst back to the communications hub telling her that, since Peridot’s rebuilt the place twice already, it stands to reason that she’ll be back tonight, and that’ll be a good time to nab her (and earn back Garnet’s faith, as Amethyst notes). This is actually something I think the show has done really well. When it started, Steven was pretty much a burden to the team, but as it’s gone on, he’s not only picked up skills to help in battle (such as his bubble), but he’s actually gotten significantly smarter. One stakeout later, the two finally see Peridot’s escape pod approaching the tower, which is strange, since the Gems have it. As the pod finishes rebuilding the tower, the driver steps out on the top (presumably to reactivate it)... Pearl. Steven’s confused by this, trying to figure out why Pearl would possibly be rebuilding the tower, and misleading them about, but Amethyst seems to know immediately, and is very uncomfortable with the implications. 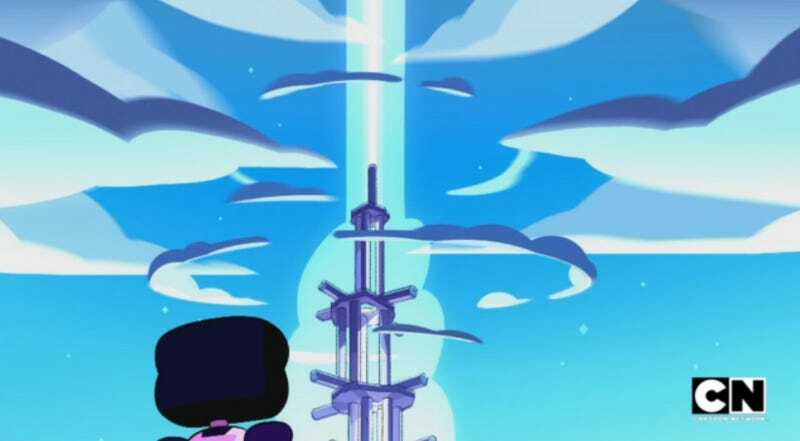 The next day, when Pearl sees the message and insists they need to go take the tower apart once again, Amethyst and Steven expose her lie just before she and Garnet fuse once again. When Garnet realizes the implication, she’s furious at Pearl. Amethyst tries to defend Pearl briefly, saying, essentially, that the rush of power from fusing with Garnet is intoxicating, but Garnet’s not having any of it. Pearl tries to explain that the first time really was Peridot, and that she just wanted to share a few more victories with Garnet, but “those weren’t victories,” as she puts it. Garnet and Amethyst fuse, and in a barely controlled rage, utterly destroy the communications hub, beyond any hope of repair. This week’s set of new episodes are off to a great start. One thing I especially love about this series is that even though the Crystal Gems are the good guys, they don’t always do good things. If you take the “fusion as a relationship” metaphor (is it even a metaphor any more? They’ve specifically acknowledged it) to this episode, then Pearl misleading Garnet to fuse with her, clearly something built on trust, respect, and an emotional connection, is pretty messed up. Yet, I feel for Pearl in a sense too. She’s lost a lot, more than maybe any other character on the show save Lapis. She has every right to hate Steven, Greg, and even the other Crystal Gems, but instead, she’s chosen to move forward, or to try moving forward at least, because that’s what Rose would have wanted. When she messes up like this, that’s tragic. It doesn’t excuse it, but it does make it very, very hard to watch. I have a feeling that things are going to get worse before they get better. We’ll see.